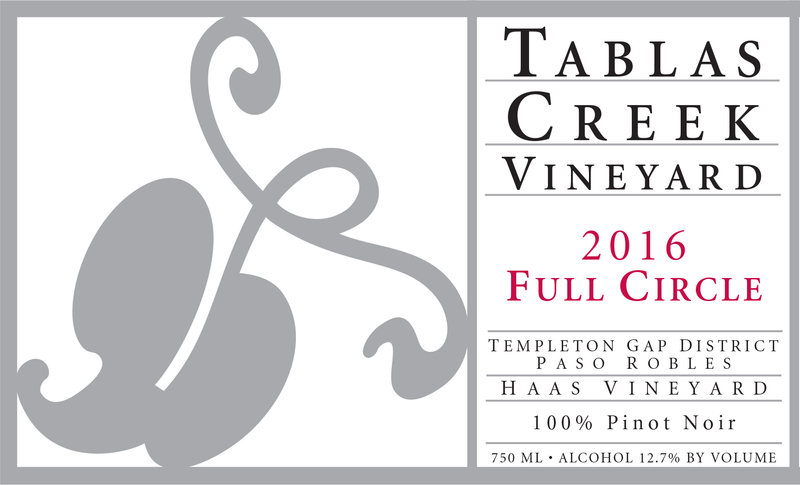 The Tablas Creek Vineyard 2016 Full Circle Pinot Noir is Tablas Creek's seventh bottling of this renowned Burgundy grape from the small vineyard outside Robert Haas's family home in Templeton. We named the wine Full Circle because it reflects his career: from a start introducing America to the greatness of Burgundy, through decades focusing on grapes from the Rhone, he's now growing Pinot at home. The 2016 Full Circle shows shows a powerful nose with both sweet (red licorice and raspberry) and savory (black tea and a graphite-like minerality) notes. The mouth is luscious and bright but structured, with pie cherry and nutmeg spice, a little thyme-like herbiness, and a lightly tannic finish that adds a brambly note and suggests the wine will be a fun one to watch evolve over the next decade. The 2016 vintage, while still marked by drought, saw better rainfall than the four previous years, and the vineyards showed good health through most of the growing season. That season started with a very early budbreak and continued warm weather spurred our earliest-ever beginning to harvest, on August 18th. But beginning mid-August, three cool weeks slowed the ripening for all but our earliest grapes, and allowed them to reach flavor and phenolic maturity with slightly above-average hang time. The resulting vintage shows excellent concentration but also remarkable vibrancy, with electric acids framing appealing juiciness. The Pinot Noir for our Full Circle was harvested between August 23rd and 26th. The grapes were fermented in one-ton microfermenters using native yeasts, half destemmed and half with stems included. After pressing, the wine was moved into year-old Marcel Cadet 60-gallon barrels, for a hint of oak. The wine stayed on its lees, stirred occasionally, for about a year before being blended and bottled in July 2017.